The intent of this blog is to highlight areas of the book collecting world that are of interest to me. Henry Altemus Books, the authors- Wayne Whipple, George Peck (and his "Bad Boy"), Hezekiah Butterworth, Jacob Abbott- juvenile series books of the 19th and 20th centuries and book/publisher ephemera. I hope there is something for all collectors here. Above is a Walker , Wise and Company edition. Sarah West Lander wrote only one juvenile series and Spectacles for Young Eyes was it. She did translate several fairy tale books from German into English but those can be discussed another time. She was born in Salem, Massachusetts in 1820 (various sources list 1810, 1819 and 1820) and she died in 1872. Her brother was General Frederick West Lander who was a very successful Civil War General. Her sister was a sculptor. Not much is known about Sarah except that she was an author. 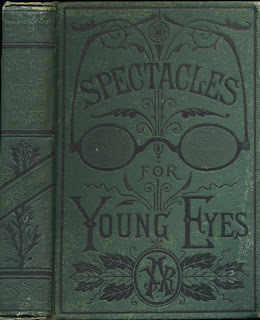 Her Spectacles Series was published by six different publishers. This was fairly typical of many series of this era. Various publishers would go out of business and new publishers would take over a series if it was a big seller. The Spectacles was a big seller. There were 8 books in total. In my bibliography I had listed thirteen books. This was an error. The original advertisements in the early Walker and Wise (1862) editions listed 12 books. Five of these were phantoms. Later in 1868 New York was added bringing the total to eight. Each book has numerous illustrations. 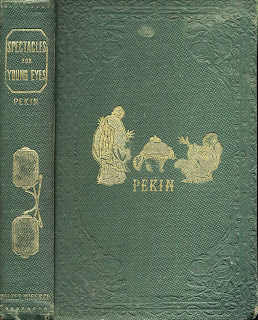 The title page of each publisher has a nice picture of spectacles with various illustrated vignettes. Here is a Walker, Fuller and Company book. The cover is identical to the Walker, Wise books. The stories tell of the worldwide adventures of Mr. Hamilton, his wife, and their children. The first five books were published by Walker, Wise and Company between 1861-1864. In 1862 Carleton Publisher of New York co-published St. Petersburg with Waker, Wise and Company. 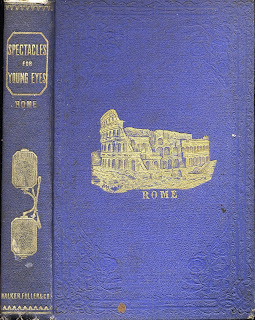 Walker, Wise was succeeded by Walker , Fuller and Company which reprinted the first five books and published Berlin and Rome in 1865 for the first time. By late 1867 Sheldon was reprinting the first seven books in a case. 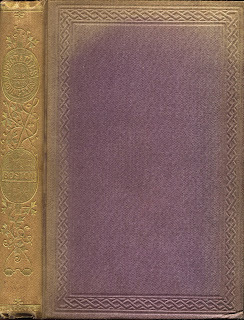 In 1868 Sheldon published the first edition of New York. Note below the advertisement with the five phantom books. To the right is the 1868 Sheldon book. John R. Anderson published this series in the early 1880's until 1884. In 1885, Publishers' Weekly noted that Dewolfe Fiske and Company made an arrangement to publish the Anderson School -Book Company's entire line of books. 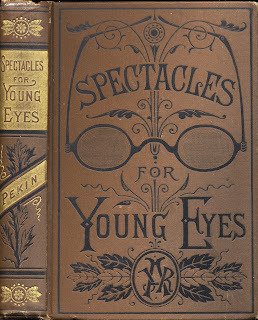 This included the eight volume Spectacles Series. The DeWolfe Fiske books have a title page with its imprint in addition to an Anderson title page. Otherwise the books are identical. In fact the cover of the DeWolfe books have the JRA initials of the Anderson publishing house. 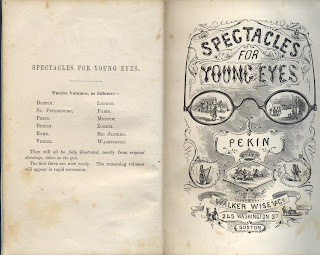 It is unclear as to when DeWolfe, Fiske stopped publishing the Spectacles' books. On the left is the Dewolfe, Fiske and Company book. The right side has the Anderson book. I like it very much because it has very helpful articles of various topics like different culture and the latest news. I am a googler and search on many topics. By searching i found this nice website. Thanks for sharing. For over 30 plus years I have been collecting Henry Altemus books, juvenile series books, 19th century juvenile books, publishers' ephemera, etc. I hope to share some of interesting things I have learned here.